A clear, bright winter's morning–there's no better time to go trail running. The Mens Skyland Crossing Jacket from Jack Wolfskin will keep you warm and protect your core from wind chill–exactly what you need when pushing your limits in cold weather. The windproof hood protects your head. When you're moving fast on wide tracks or pushing hard on narrow trails, the jacket shields your torso from the headwind. 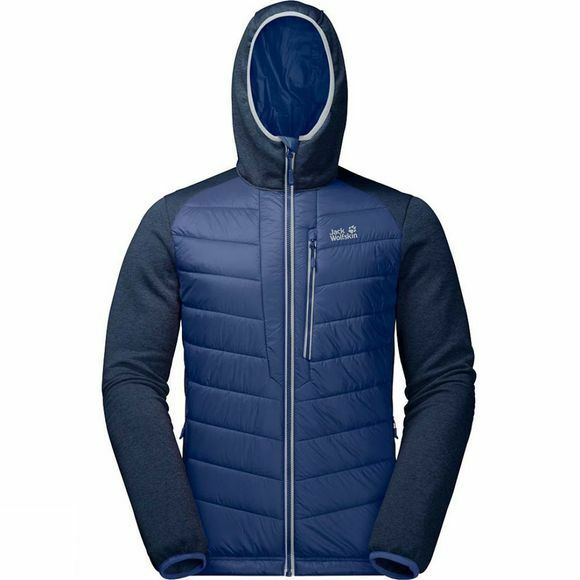 The front of the jacket uses a combination of a windproof outer fabric and highly functional synthetic insulation. The sleeves and back are made of a highly breathable stretch fleece fabric for improved mobility and climate comfort. All the fabrics used in this jacket promote optimised wicking performance. So even when you sweat, you benefit from a consistently high level of comfort.